There are a number of time prophecies in the Bible, mainly in the book of Daniel. We also have some in the book of Revelation and we have a few, a minority of them, in the book of Isaiah. I will look at a particular time prophecy in Isaiah. The subject of time is the most difficult part of prophecy. This is because we all want to know when events being described in the Bible will occur. That is what we want to know, but only God can reveal these things to us. That is quite a statement Peter made because he says this “salvation the prophets have enquired and searched diligently” about, they not only gave the prophecies, they “searched diligently” and “enquired.” They asked when the prophecies would occur. What were they searching for diligently and enquiring about? They were wondering constantly about the very things that they were prophesying. Notice those first two parts of verse 11 there, they were searching and enquiring diligently concerning the “what” of salvation and also (our subject today, the dislocation of time prophecies) they wanted to know the “manner of time” that these things would occur. Obviously it shows that they must not have known all about the “what” of salvation, that is all the factors concerning salvation itself, although they picked up that information piecemeal here and there, from their own prophecies and the prophecies of others. But they also wanted to know the “manner of time.” This was a problem with the prophets. This means they were not to know all of the factors concerning prophecy. This is what Peter says. It is revealed “that not unto themselves” were they to minister, but really unto the apostles, the people of Peter’s time. Of course, we are an extension of the apostles time, because the gospel is with us and it really comes down to us. Look at the last part of verse 12, “... which things,” concerning salvation (the “what,” the “manner of time”) that the prophets themselves enquired diligently about what they did not completely understand, “which things the angels desire to look into.” Even the angels want to know the “what,” and the “manner of time.” If angels do that and perhaps have a deficiency of knowledge along some of these lines, at least in the time of the apostle Peter they did, how can we human beings know much more? I think that we might be able to. I can say that without arrogance because we have something vouch-safed above which perhaps even angels do not have. That is the Holy Spirit of God in an intimate way to teach us of God’s ways, prophecy and everything else. I think we ought to realize that we should not be haughty with that knowledge and understanding because we still come far short of understanding even the basics of prophecy in some cases. But I wanted to establish this principle before going into a major prophecy to give an example of the dislocation of time in prophecies and how it is important for us to consider. I wanted to give this principle first because it shows that the prophets themselves did not know the manner of time in which their prophecies would be fulfilled. The section I want to take you to begins with Isaiah chapter 7. I am going there because the apostle Peter, when I showed that principle, gave it in the context of talking about salvation. Salvation comes from only one source, that is the Lord Jesus Christ. Jesus Christ is prophetically indicated in these chapters that I will go into. At the same time these chapters will help us comprehend this dislocation of time in prophecies. The prophecy I want to give you starts in verse 1 of chapter 7, but it goes on through chapter 8, chapter 9, chapter 10, 11 and concludes with the last verse of chapter 12 of Isaiah. Many critical scholars acknowledge this, although some do not. But a close analysis of these 6 chapters shows that it is one long prophecy given to Isaiah at a particular time in human history. There are three important principles that I want to give you for the interpretation of prophecies, and especially those relating to time. Always view the prophecies that are given in the Old Testament and the New Testament from the vantage point of the prophet when they gave the prophecies. After all, they use terms which were relevant to their time. In this case it will be the middle of the 8th century B.C.E. when Isaiah lived. Isaiah looked around him and saw several factors in evidence. He saw certain personalities on the scene, kings and other people. He saw nations come into existence at that time. He understood the geography of his time. All of the prophecy is within the context of the middle of the 8th century B.C.E. It is not the context of 1st century C.E. It is definitely not that of the 20th century C.E. It is important to understand the history of the times to comprehend prophecy. It is one of the main reasons why God has devoted a tremendous amount of time in showing us the history of Israel. We have 1st and 2nd Samuel, 1st and 2nd Kings, and 1st and 2nd Chronicles, so we can pick up the history of what was happening when these prophecies were given. Many people avoid completely the history of the period when the prophet spoke, and avoid the factors he was in contact with: geographical, political, and religious. Then they try to say with dogmatism that they understand what the prophecy is all about. We have to start by trying to see these factors through Isaiah’s eyes and then comprehend how he viewed things. It is quite true, as the apostle Peter told us, that they did not know the “manner of time” when some of these prophecies would transpire, so we have deficiencies in understanding, but it is best to start out with that first principle, view the prophecy from the time of the prophet and look at it through his eyes. View the prophecy from the interpretation given by Jesus Christ and by God’s apostles in the New Testament. When they looked into the Old Testament they saw many prophecies and applied them to events in the 1st century C.E. They gave their interpretations under the influence of God’s Holy Spirit. While it is true that Isaiah, Jeremiah, Ezekiel and the others, may not have comprehended as much spiritual truth as Christ and the apostles because it was not yet time for that, we must pay close attention to what the Gospels say and what the apostles say in the Epistles concerning the interpretation of these prophecies. That does not mean they did not understand some of it. As time went on they were to understand more. For us the end of the age is approaching. We have to be careful with that term, I know, but the book of Daniel says that when the end of the age comes, the understanding of prophecy will be made clearer. We are certainly, with every moment getting closer to the end of the age. No one can dispute that point. “... and Pekah the son of Remaliah, king of Israel, went up toward Jerusalem to war against it, but could not prevail against it. Rezin and Pekah had already picked the man that they wanted to be king in Judah once Ahaz was gone. They were warring to secure that end. He told Ahaz not to tremble because within 65 years these kingdoms will be gone. That ought to give some comfort to Ahaz. This prophecy is one of the most important in the entire Bible because it has to do with our Lord. It deals with His emergence, when He was to come on the scene because Immanuel will come into this here. This long prophecy, which starts in verse 10 with a major sign to be given to Ahaz, continues all the way through various events until the end of chapter 12 of Isaiah. The prophets, as Peter said, did not necessarily understand the manner of time. But Isaiah said that within 65 years these kings here would not be troublesome any more because they will be done away with. Was Isaiah correct or not? Here is where history can help us. In verse 10 we start the prophecy that Isaiah gave to Ahaz. Even though Ahaz was reluctant to accept it, nevertheless Isaiah gave it to him. I want you to note the individuals involved in this prophecy. Isaiah’s two sons, although we have only seen one son by the name of Shearjashub. We will come in contact with another son of Isaiah later on. Ahaz, King of Judah. He is of the household of David. Rezin, the gentile Syrian king will come into it. Pekah, king of the Northern kingdom of Israel will come into it. The Israelite king was not of David (nor was the gentile king). A man later to be born who assumes kingship over all the land of Israel and becomes the chief scion of David. His name is Immanuel. Finally, there is the Assyrian. It is both in the singular, talking about the Assyrian king, but also you find it in the plural, the Assyrians. They also will come into the picture of this long prophecy. Keep these players in mind within the historical context. The prophecy beginning in verse 10 has to do with our Lord. Many have read verses 14, 15 and 16, and taken them out of context. We have not really put together all that is said about Immanuel which we find in all these 6 chapters. Let us take everything together in this long prophecy because when Isaiah looked Ahaz in the eye he gave him the whole prophecy concerning Immanuel, he did not isolate one part of it and instruct Ahaz to apply it. He gave the whole thing together. The entire prophecy must be read all together the way that Isaiah gave it to Ahaz. When you read it together, understand that a pressure situation was upon Ahaz at the time this prophecy was given. The city of Jerusalem was under siege by two united armies that sought to depose Ahaz from the throne and kill him. He was not interested in what was going to happen 100 years from now. He was not interested in what was going to happen in 500 or 1000 years. He was interested in what was going to happen then. If you had an opportunity like this, what sign would you ask for? God said ask any sign; I do not care what it is, in the height above or the depth below. Ahaz, you can ask it. Ahaz did not want to ask for any sign, which would have meant a miracle of some kind. He could have asked for the earth to stop revolving if he wanted to. He could have asked for something else to happen. He could have asked for anything. Ahaz replied, “I will not tempt the Lord.” If you knew the evil character of Ahaz as depicted in the book of Kings, you would have to say that was probably the most righteous thing that man ever said in his life. He was king Hezekiah’s father, one of the most righteous kings that ever lived, but Ahaz was so evil that he even closed the Temple of God for sixteen years during which no one could go into it. When God gave Ahaz this sign it was the most marvelous miracle that ever happened in the history of the world — better than the stopping of the earth, better than the opening up of the Red Sea, better than one coming out of a tomb alive like Lazarus — better than anything given in the history of the world because this sign will involve the eternal God Himself coming into human flesh. When you put it all together in this long prophecy, it is a miracle of miracles, the most magnificent miracle this world has ever seen. Who were the kings? Rezin king of Syria and Pekah king of Israel. The land Ahaz abhorred “will be forsaken of their kings.” From the vantage point of the 8th century B.C.E., would you not imagine that in some time in the near future, certainly within 65 years (because that was the time period given), the virgin, perhaps a particular virgin known at that time, will give birth to a child and his name it will be Immanuel, “God with us.” Would you not imagine that within a 65-year period, that young boy born of that virgin would begin to do some of the exploits that this prophecy later says he will do? I suppose you might think that. Look at the whole scene. They are at the conduit at the upper pool near the fuller’s field and talking in this environment of the 8th century and God says I will give you, Ahaz, a sign. He is talking about these two powers being forsaken. Now all of a sudden we find the Assyrians coming on the scene. Verses 18 through to the end of the chapter speak about the Assyrian going to tear up Syria and Israel. Chapter 8, 4 the prophecy continues. Notice that in verse 3 we have a fundamental distinction between the prophecy concerning Immanuel and this prophecy concerning Mahershalalhashbaz. Though a bit later we will find that the two are allied as far as to what will be done, yet they are distinct from each other for several reasons. “For before the child [Mahershalalhashbaz] shall have knowledge to cry, ‘My father, and my mother,’ the riches of Damascus and the spoil of Samaria shall be taken away before the king of Assyria. Judah was saying, let us confederate with Assyria. Let us be as one and we can both take care of Ephraim and Syria. Isaiah was told by God, that Judah was to have nothing to do with that confederacy. 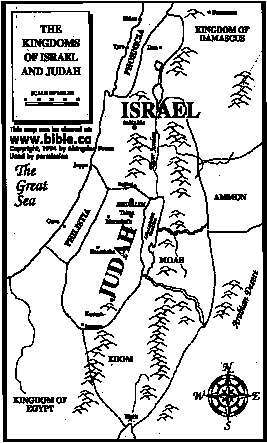 In the northern areas when the Assyrians first came into the land about the year 771 B.C.E., about 30 years before this time of Isaiah, they made a foray down into this territory and “lightly afflicted” the land of Zebulun, Naphtali and land on the other side of the Jordan. Isaiah is saying that he fears when the Assyrian comes this time he will not lightly afflict like he did 30 years before. It will be far more disastrous. Notice verse 6 we are still talking about Immanuel, born of the virgin who will be the leader of the land of Israel. He will be a son of David. This is new. We have been told that a virgin would conceive and bear a son. Now we are told that here is the child being born and indeed he is old enough for the government to be placed upon His shoulders. Remember that this whole prophecy here involves, as far as Isaiah was concerned, about a 65-year period. Try to look at it from his viewpoint and the point of view of Ahaz. Within 65 years all these things have to transpire. I will not go into the intricacies of the Hebrew here, but this is still part of the same prophecy. We have to put Isaiah 7:14 together with 9:6–7 because we are having a history of Immanuel being described. Verse 8, “The Lord sent a word into Jacob, and it hath lighted upon Israel” (Isaiah 9:8). The next verses to the end of the chapter talk about a step-by-step destruction of the land of Israel. Read it for yourself. It says in the Hebrew, “because of the oil,” or you might say, because of the anointed one. That is interpretation, but on the other hand, I am sure that is what it means because Assyria will take these people captive, including Judah. At the same time the anointing, or shall we say the oil or the one of oil, maybe the anointed one (again, that is interpretation), but the anointed one will take care of matters. We know who the anointed one is, the one being talked about from Isaiah 7:14 to this passage here; his name is Immanuel. He will take care of matters. From Isaiah 10:28–34 we have the last step-by-step movement of the Assyrians from the north to completely destroy Jerusalem. All of us who were down there in Israel about a month ago, 9 were in the very region where this Assyrian and his army will move step by step southward toward Jerusalem. In verse 28 Isaiah picks up the movement of this Assyrian making his last attack upon Jerusalem, about 10 miles north of Jerusalem very near Bethel. In actual fact it is the place called Ai. Then he passes to Migron a little farther south. At Michmash “he has laid up his carriages.” That is about 7 miles north of Jerusalem. Then he carries on south and goes over the Michmash passage. If you ever go down to the Jerusalem area, you can see it quite clearly. Then they take up their lodging at Geba, about a mile south of Michmash. “Ramah is afraid”; that is another ½ mile south. “Gibeah of Saul,” the ancient capital of Israel in the day of Saul is another 1½ miles south. Then he continues on farther south. He is about 4 miles north of Jerusalem when he gets to Gallim and Laish and, “O poor Anathoth.” Anathoth is where Jeremiah the prophet was born, about 2½ miles north and east of Jerusalem. He continues his progress. When you get over that small rise coming from the north and over the small rise of Mount Scopus, all of a sudden the great panorama of Jerusalem comes into your view. This is where the Assyrian will be according to Isaiah; he will look over all of Jerusalem, shake his fist at the city and prepare to attack it. Isaiah looks on this Assyrian army as like a forest on the move, small trees, big trees and the biggest of all the cedar of Lebanon, the Assyrian king. Look what will happen to this forest. It will be cut down in the environs of Jerusalem. They shall “cut down the thickets of the forest with iron,” with an ax, “and Lebanon shall fall.” Look at the last part of verse 34, fall by whom? “By a mighty one” or “by a noble one.” Someone will cause the Assyrian to fall in the environs of Jerusalem. Starting in chapter 7 the one who will do this will come from a virgin, his name will be called Immanuel, and He is called “God with us.” In chapter 9, once he begins to grow up we find that the government will be put upon his shoulders. He will be the prince of peace. He will be wonderful. He will be a Counselor. He will be the Mighty Father, as it says in the King James Version. Here the one of oil will take care of the Assyrian in Isaiah 10:27. Here he is called “the noble one” or “the Mighty One” as the King James has it. “And shall make him of quick understanding in the fear of the Lord: and he shall not judge after the sight of his eyes, neither reprove after the hearing of his ears: But with righteousness shall he judge the poor, and reprove with equity for the meek of the earth: and he shall smite the earth with the rod of his mouth, and with the breath of his lips shall he slay the wicked [wicked one]. Notice verse 10, “And in that day.” I suppose Isaiah and Ahaz thought, looking at it from their vantage point, it would occur probably within 65 years. What did Isaiah really understand? Peter said concerning the “what, or what manner of time” lots of the prophets did not understand everything. That is a fact. Many of the apostles took prophecies right out of this long prophecy in Isaiah and applied them to the time of our Lord. And truly they did apply at that time because He was born of a virgin, but not in the time of Isaiah. Mahershalalhashbaz was born, but not of a virgin, but of a prophetess, who I think took the place, shall we say, of the virgin. But the virgin birth did not occur until about 742 years afterwards. And to our very day Jesus Christ has not yet taken the government upon His shoulders, the government coming from David upon Mount Zion. Many things concerning the Assyrian can never be shown in history to have occurred, such as his movement from the north straight south to Jerusalem, and waving the clenched fist against Jerusalem. When the Assyrians back in the 8th century came down, they came the seacoast route. This is clearly demonstrated not only in the Bible, but history and archeology clinches it as well. The Assyrian came down to a city of Lachish, and then from Lachish he attacked Jerusalem in that manner, and he did take it over in actual fact, but Jerusalem was left intact. And though Judah became a vassal kingdom of the ancient Assyrians, and though some of the Jews were taken captive, most were not. These prophecies here cannot be shown in history to have taken place in any fullness. Let us face it. Has the Immanuel who was born of a virgin some 1,900 years ago taken upon Himself the mantel of government yet upon this earth? The answer is no. The apostles looked at this long prophecy here and applied some prophecies concerning Immanuel to the 1st century C.E., but there are still some portions concerning the Immanuel that have not yet taken place. The putting down of the Assyrian, the setting up of universal world dominion under the true Messiah, neither has taken place. The wolf is not dwelling with the lamb. You would not find the cow and the bear being together, or the lion eating straw like an ox. Do we find that the knowledge of the Eternal is throughout the extent of the earth as the waters cover the sea? No, not yet. But look at verse 10, “And in that day ...” Isaiah does not tell us when it will be. I suppose he thought it would be soon. Time is dislocated in this prophecy of Isaiah. So “there shall be a root of Jesse” in that day. He shall not only stand for an ensign for Israel, but for the Gentiles. Ephraim and Israel will come back to the land of Palestine (Isaiah 11:11–13). They will come back to the land of Palestine. Read right on. Do not stop because we have one more chapter to go. “ And in that day you shall say, O Lord, I will praise you: though you were angry with me, your anger is turned away, and you comforted me. Behold, God is my salvation; I will trust, and not be afraid: for the Lord Jehovah is my strength and my song; he also is become my salvation. Therefore with joy shall you draw water out of the wells of salvation. And in that day shall you say, Praise the Lord, call upon his name, declare his doings among the people, make mention that his name is exalted. Sing unto the Lord; for he has done excellent things: this is known in all the earth. Shout in the midst of Jerusalem. No wonder Immanuel is here called “God with us” because he will be in the midst of Jerusalem. Who is he? A stem of Jesse, a branch out of his roots. He is seen to sit on the throne of David. He is to accept the government that will be upon his shoulders. He will be Wonderful. He will be a Counselor. He is even called the Mighty God, which means God with us. He will put down the Assyrian as the stem out of Jesse. That tree of Israel will grow up once again, but it will be the stem of Jesse that will cause it to happen. If I were old wicked Ahaz back there and Isaiah came to me and said, what sign would you like God to give that you will have peace? Ahaz did not want to tempt the Lord, but if I, Ernest Martin, were living in that environment where two powers were within an ace of taking over Jerusalem and perhaps killing me, and all of that, and the Assyrians were menacing up north, war all over the place, you know what I would ask for? If I could have a sign that is in the depths below or the heights above, anything you want? I would ask for universal peace on this earth, happiness and joy, bring it to pass is what I would have asked for. Ahaz did not do it. He did not want to ask. Do you know what God did? God told Ahaz something that was as grand as any man could ever conceive of, because He told him the sign He would give Ahaz was to start with a virgin birth, with a young man being born. He will come on the scene. He will grow up. The government will be upon his shoulders. He will be God in the flesh, Immanuel, the Mighty God, the Everlasting Father. God Himself was saying, I will intervene in world affairs and I will bring in universal peace and prosperity and a knowledge of the Eternal from shore to shore and from land to land throughout the entire earth. That is what I will do. From the New Testament point of view, when we read the apostle Paul, though this prophecy here only concerns the earth, we can extend that message concerning the stem or the rod out of Jesse, the branch, not only to the earth, but He will bring peace and reconciliation and joy and happiness to the entire universe. When you get right down to it, is that not the greatest sign that could be given to anybody, the entire universe coming to a knowledge of God and coming to a peace with God? And though this prophecy here only has to do with the earth, from the New Testament we know that the Immanuel, who is God with us, to bring about reconciliation to all and every one. That is the greatest sign ever been given in the history of the world. It is still being given. It does go beyond the depths below or the height above. We are in the midst of prophecy now! And though Isaiah did not know the manner of time, probably thinking it might occur in 65 years (and certain things did occur), many elements that concern Immanuel have about a 2,500 year history, in fact maybe a 3,500 year history. In fact, maybe many elements have longer than that. That Immanuel will bring in universal peace and reconciliation to the entirety of the universe is the greatest sign that God ever gave to mankind. 1 I know in the past I have said that Zechariah chapters 12 to 14 speaks about things to happen in Israel and the Middle East, but I mentioned at the last that we do not have an absolute time schedule when that will occur. It will occur, but exactly when, that is a problem. 2 Damascus is still the capital of Syria today and will soon have a time of prominence. See “The Damascus Phase of End-Time Prophecy” at http://www.askelm.com/temple/t991101.htm. 3 We do not know how old he was, he could have been a young boy or a younger man. 4 Remember that chapters are King James indications. You go right on in the original Hebrew with no chapter breaks. 5 In verse 18 of chapter 8 Isaiah talks about both these children, “Behold, I and the children whom the Lord has given me are for signs and for wonders in Israel from the Lord of hosts, which dwells in mount Zion.” (Isaiah 8:18). Isaiah says that he and his two sons are signs. Each of them had names that had meaning. Isaiah’s name means “salvation is of God.” Shearjashub means “a remnant shall return.” Mahershalalhashbaz means “that he makes speed to the spoil,” in the context of the Assyrian coming down to take over Ephraim and Syria. Shearjashub indicates that a remnant shall return and not be taken captive by the Assyrian. Isaiah’s name means that their salvation will come from God, finally. Each of them — Isaiah and each of his two sons — are to be distinguished from Immanuel. 6 This verse 14 where it says “but for a stone of stumbling and for a rock of offence,” the apostle Paul in Romans 9:33 applies this to Jesus Christ clearly and plainly. It is interesting, he applies it to Jesus Christ for his time. First Peter 2:8 also quotes the same scripture and who does Peter apply it to? To the Immanuel who came forth from Mary. So Peter takes this out of the context of the 8th century B.C.E. and puts it into the context of the 1st century C.E. 8 God worked a marvelous miracle for Israel by overcoming the Midianites (Judges 6:1–8:21).